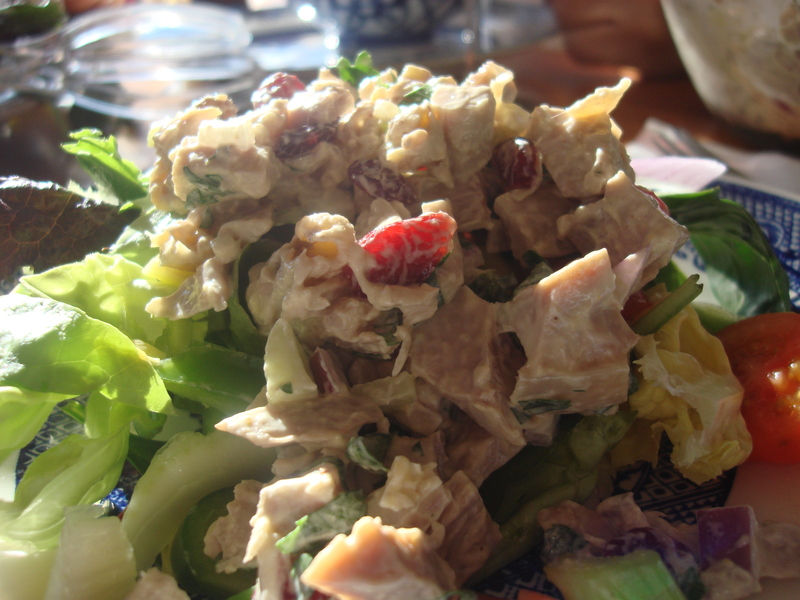 My favorite quick dress-up for food that takes me from workaday-dull to bright and shiny: dried cranberries and walnuts. My take-to-work breakfast? Plain nonfat yogurt, swirled up with some honey, a handful of cranberries and another handful of walnuts (bought in big bags at Costco – they last and last). Crunchy, creamy and sweet – oh yeah. At home, I add them to spike up instant oatmeal. I also substitute half the raisins in oatmeal raisin cookies with cranberries for a brighter flavor and add walnuts for crunch and depth. Boring salad? Add handfuls of cranberries and walnuts and make it fancy-schmancy (especially good with orange/clementine segments, red onion and feta – separately or in combination). Today I incorporated them into my leftover turkey salad. Zippy! Mix all together in a bowl and serve in sandwiches or over salad. Notes: Cranberries (Vaccinium macrocarpon), blueberries and Concord grapes, are the only commercially-grown native North American fruits! They are loaded with vitamin C and dietary fiber and manganese and other good things and may very well help prevent some urinary tract infections in women, but the jury is still out on that.